There are so many places to find reviews online. They might be buyer reviews on Amazon, comments on social media, or of course, the infamous Yelp. You might even house reviews on your site that you curate yourself. When you’re trying to build up your online reviews, where should you focus? Which platforms are the most worth your time? The reason that our service here at Review Gram focuses on Facebook and Google is because we have found those to be the most important, universally. Both of these review platforms are powerhouses, and they’re highly-trusted as sources when people are making a buying decision. Google: Google reviews will have a major impact on your local rankings. This is a vital part of modern business for anyone location-based. When people do a simple online search for your services, your business will (ideally) show up in a special map graphic on the results page. 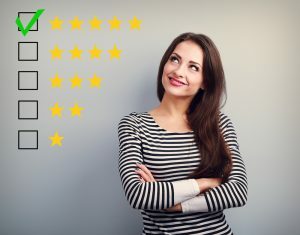 Along with basic location and contact information, a review star rating will indicate whether Google users have been happy or unhappy customers of your business. Google reviews are hard to falsify and manufacture, so they’re well-trusted by shoppers. Facebook: Facebook is another trusted review resource, mainly because of the personal referral potential. On Facebook, users can easily see if any of their friends have used and reviewed the product or service. So, if they see that their sister-in-law has been to a certain restaurant and liked it, they can chat with her to learn more about it. Facebook reviews are also a large part of your effort to build up a social media presence, which is a powerful tool in any referral-based local business. Depending on your business, there are other online review resources that have a lot of clout. For example, if you’re a doctor or a health professional, most people researching you are going to end up on Healthgrades at some point. Or, if you’re a home service professional (like a plumber or painter) then you’ll probably want to have an Angie’s List listing and strong reviews. Each platform will have different regulations and processes, but most will allow you to control your profile, and respond to reviews. So make sure that you’re aware of your online presence in those places, and respond courteously to reviews whenever possible. Alright, what about the platform that absolutely drove the online review trend in its early days: Yelp? Yelp is one of the most well-known platforms out there, and as such, it has a lot of power. However, we didn’t put it as a necessity, because Yelp reviews have come under a lot of scrutiny as a reputation-ruiner. Early on, it was easy to falsify and tank a business’ reviews, and although that has changed somewhat, Yelp is still something that savvy shoppers regard with a grain of salt. So, if you need to start prioritizing your review-gathering efforts, start with the essentials. Encourage Facebook and Google users to start reviewing you with their verified accounts. Then spread farther to other platforms that suit your business best. Review Gram’s services are made to help you make the most of positive customer interactions and gather effective reviews without monopolizing your time and efforts. Check out the process here to understand more about our product and how it can help your business.